For the second time in three weeks, the Pahrump Valley High School football team was locked in a tight struggle at halftime. And for the second time in three weeks, the Trojans wore down an opponent and pulled away to win. 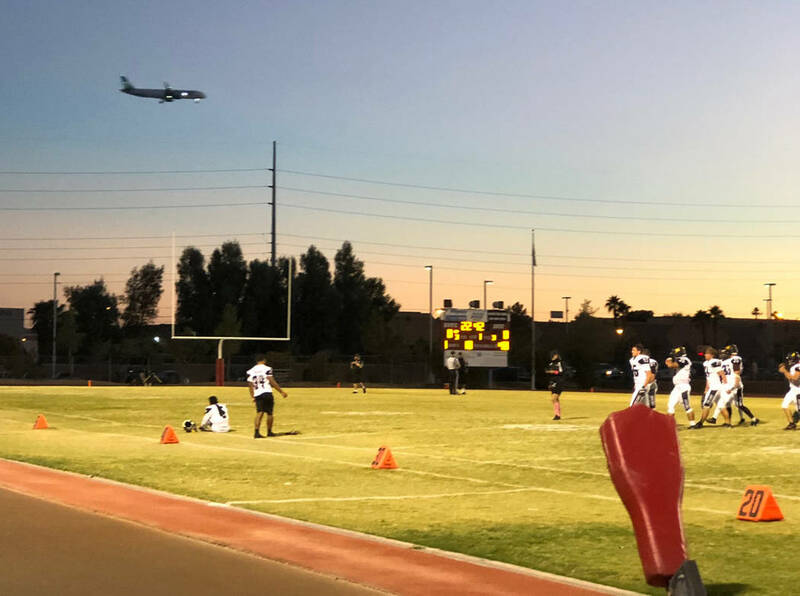 Tom Rysinski/Pahrump Valley Times Passengers on a flight coming in for a landing at McCarran International Airport had a brief view of the Pahrump Valley High School football team warming up for its game Friday night at Del Sol. Peter Davis/Special to the Pahrump Valley Times Pahrump Valley football players gather around coach Joe Clayton for a pregame talk before taking on Democracy Prep, the first of what has become three consecutive wins in Sunset League games for the Trojans. Peter Davis/Special to the Pahrump Valley Times Pahrump Valley senior Tristan Maughan, shown tackling Boulder City's Thorsten Ballmer earlier this season, had the first of four sacks against Del Sol quarterback Andre Nevarez during Friday night's 27-14 Trojans victory over the Dragons. Peter Davis/Special to the Pahrump Valley Times Center Jakob Landis (64) and guard Caleb Sproul (72) open a path for quarterback Dylan Wright (7) to run through against Democracy Prep. Wright ran for a touchdown and threw for another during Friday night's win at Del Sol. 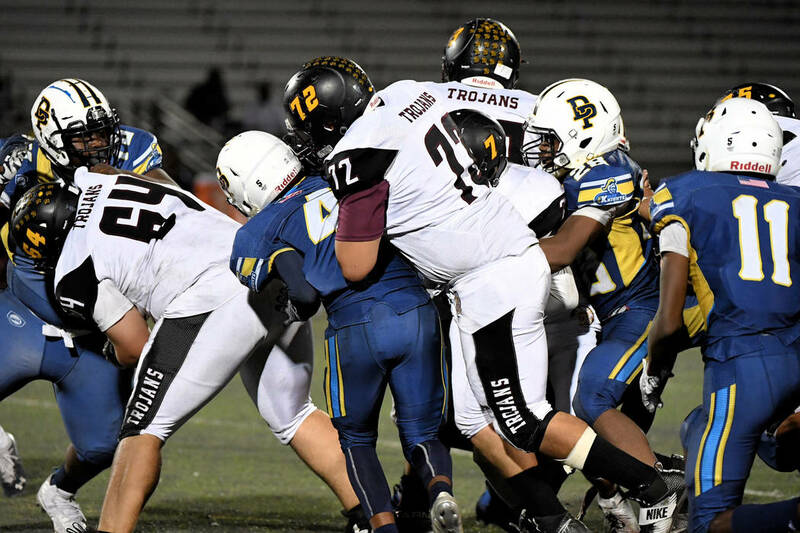 Casey Flennory rushed for 138 yards and two touchdowns, and the Trojans’ defense contained the top passing attack in Southern Nevada to record a 27-14 victory Friday night at Del Sol. The win kept Pahrump Valley (4-3, 3-0 Class 3A Sunset League) alone in first place and clearly in the driver’s seat for a first-round playoff bye. A win by the Dragons (4-4, 1-2) would have created a four-way tie atop the league. Unlike two weeks ago against Democracy Prep, when each team scored four first-half touchdowns, this time it was a defensive struggle which went to halftime tied 7-7. And unlike most Pahrump Valley football games, defense was the big story against Del Sol. It was just a few weeks ago that coach Joe Clayton said that opponents, noting the Trojans’ weakness in pass defense, would throw more than usual against them. That’s not likely to happen again. Maughan recorded the first sack of Del Sol quarterback, Andre Nevarez, but not the last. 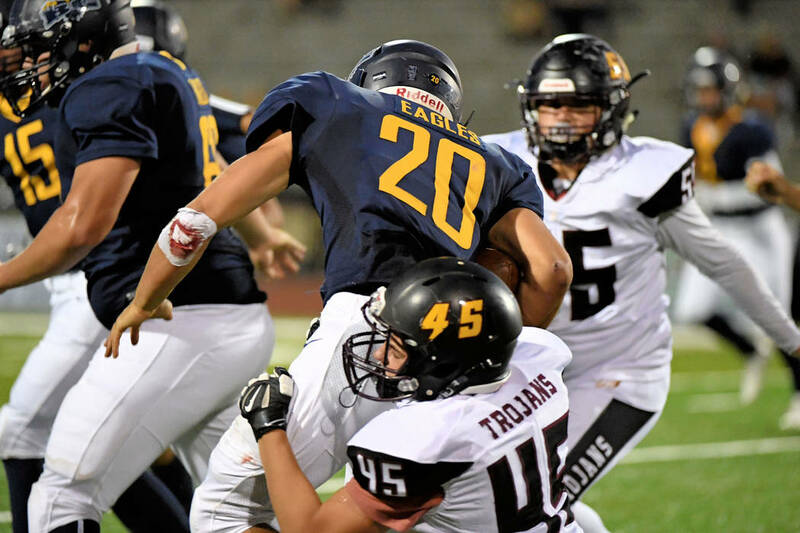 The Trojans would sack Nevarez three times during the second half, including on back-to-back plays bridging the third and fourth quarters after the Dragons neared midfield trailing by just five. Nevarez completed 12 of 24 passes for 122 yards. Not terrible numbers, but he had been averaging more than 240 yards per game. But this time, his most important play was a keeper, when he zig-zagged through and around Trojan defenders for a 25-yard touchdown that gave the hosts a 14-7 lead in the third quarter. On this night, it was the normally methodical Trojans coming up with the big plays. In what has become a feature of the Pahrump Valley offense, quarterback Dylan Wright twice found senior back Joey Koenig open behind the defense for big gains. The first was a 69-yard bomb on the drive following Nevarez’s touchdown run, and the second went for 42 yards to the Del Sol 13 that led to a 6-yard scoring run on fourth-and-3 by Flennory. Koenig has caught six passes for 294 yards this season, but opponents continue to get burned deep. The other big play came courtesy of Flennory, who on a first down with 3:25 left in the third quarter took a handoff, appeared to look for an opening inside, then swept left and kept running for 69 yards to the Del Sol 3. Two Wright keepers later and the Trojans had the lead back at 19-14. Suddenly, the team that had held Pahrump Valley’s jet offense in check during the first half seemed beaten. After Wright’s second pass to Koenig that led to Flennory’s second touchdown, the Dragons trailed by two scores just 13 minutes after taking a 14-7 lead. Nevarez completed just one of his final six passes, ironically his longest pass of the game, for 28 yards to Maalik Flowers that put the Dragons on the Trojans’ 33. But an illegal block two plays later pushed them back, and on third-and-36 Del Sol’s last gasp was snuffed out when a desperation pass landed harmlessly into the hands of Pahrump Valley’s Dylan Grossell. Then the Trojans everybody expects to see ate up the final 5:24 off the clock, running 13 plays and gaining four first downs to end the game. 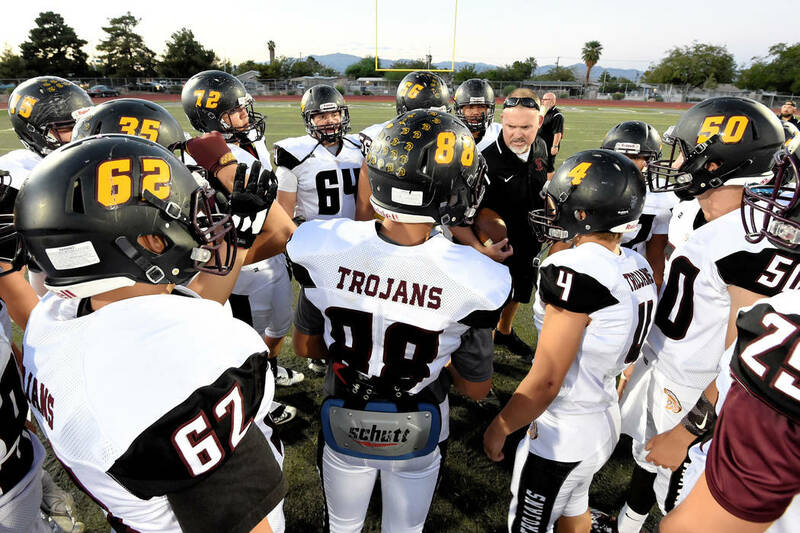 Only two league games remain for the Trojans, Friday against Western at home and Oct. 19 at Valley. They control their own destiny for the Sunset League title. Contact Sports Editor Tom Rysinski at trysinski@pvtimes.com On Twitter:@PVTimesSports. Pahrump Valley (3-0): Friday vs. Western (0-3), Oct. 19 at Valley (2-1). Cheyenne (2-1): Friday vs. Democracy Prep (1-2), Oct. 19 vs. Del Sol (1-2). Note: Pahrump Valley has defeated Cheyenne. Cheyenne has defeated Valley.